For the box design alone, this months Birchbox* is definitely up there as my favourite box so far. 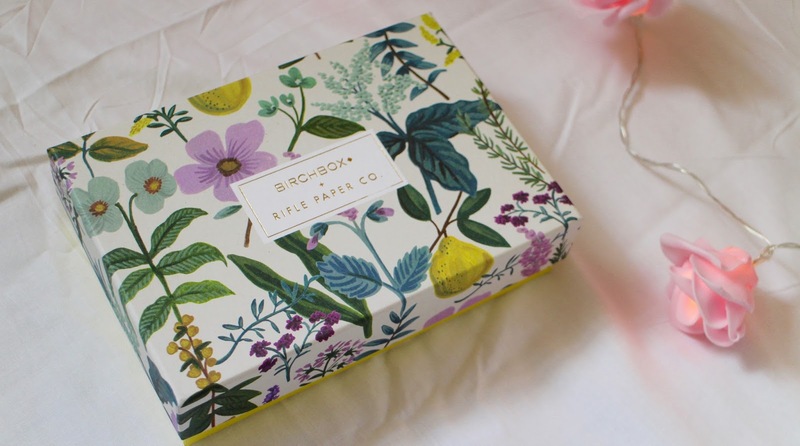 For the month of April, Birchbox collaborated with 'Rifle Paper Co' to bring subscribers a beautifully designed box of their choice out of two designs. I went for this one and I'm so happy I did. It's so pretty and I currently have the empty box on display in my room with some candles sat in it. I don't throw the boxes away, I actually use them to store make up in my Alex drawers from Ikea, but this one was too pretty to not have on display. I love my floral prints and this design from 'Rifle Paper Co' is stunning. 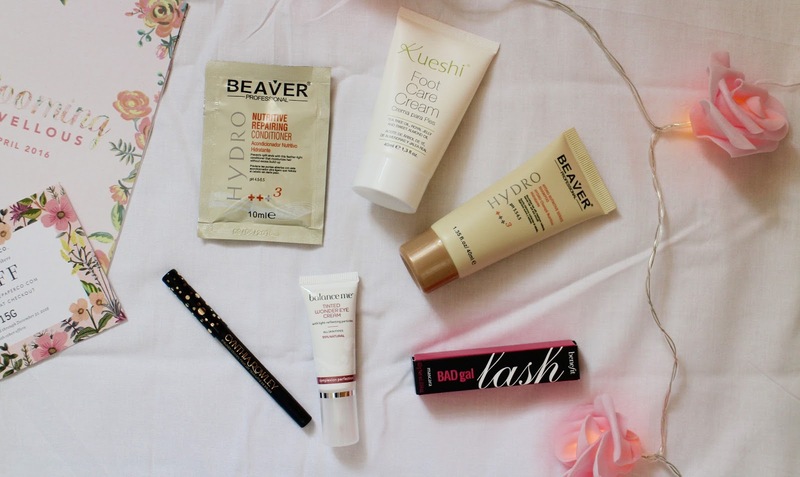 Box obsession aside, I actually loved nearly every product in this months box. Benefit BADgal mascara - always a favourite of mine, I actually always say I'm going to buy a full size of this mascara but it seems to be the one that's given away as a sample a lot so I've never bothered. I ran out of my other one so I was delighted to see this in the box this month. I love the wand on this, it really helps plump up your lashes and adds some well needed definition to my lashes. I think I need eyelash extensions rly guys. Cynthia Rowley eyeliner - I actually thought I wouldn't get any use from this eyeliner, I'm not very good at doing cute little eye flicks or anything like that but I've surprised myself. I've been using it to tight line and to do tiny little flicks. I find because the pencil is pretty small (sample size yay) that I can get that little bit more control with the nib and it doesn't look a total mess. In contrast to other eyeliners I've used this one is a lot creamier and creates a nice full line that lasts throughout the day. I'm going to be buying a full version of this because I liked it that much and it's only 11£ && yano, packaging is a winner here too. Balance Me tinted wonder eye cream - this eye cream really intrigued me because I've never used a 'tinted' eye cream before. Balance Me is a brand I've only heard of recently (free sample in a magazine with a face mask) and I'm really liking their stuff. I was pleasantly surprised by this eye cream, I have awful black circles beneath my eyes and nothing seems to cover them up but this did a semi decent job. I wouldn't say it fully covered, but it did a nice job of minimizing how harsh they look. Beaver Professional shampoo and conditioner - I haven't used these yet but they sound really nice, there's avocado oil and aloe vera in them. Kueshi foot cream - I didn't use this either. I'm not into foot cream really (Soap and Glory is the only one I use) and knew this would end up in the back of my drawer so I gave it to my Mum and she seems to really like it. I'm really enjoying this months box, especially the mascara and eyeliner and yano, the box itself. I'm a sucker for pretty things. I'm very excited for next months box because there's a Spectrum blending sponge and again, you choose what color you want. I went for lilac and I love a good beauty blender so I can't wait to try Spectrums version. Are any of you subbed to Birchbox? I love the design of this month's box, so pretty!! This is completely different to the boxes that were sent out to people who bought it.